OSIRIS-REx contains five instruments to explore Bennu, each of which provides important information for the mission. This suite of instruments is used for remote sensing or scanning the surface of the asteroid. These will map Bennu and establish what makes up the asteroid, including the distribution of elements, minerals and organic material. The OSIRIS-REx Camera Suite (OCAMS) consists of three cameras: PolyCam, MapCam, and SamCam. These cameras will “see” asteroid Bennu as the spacecraft first approaches it. OCAMS will then provide global image mapping of Bennu’s surface and more detailed images of potential sample sites. Finally, OCAMS will record the entire sampling event during the touch-and-go (TAG) maneuver. PolyCam, an 8-inch telescope, is the first to acquire the asteroid from 2 million km away. Once the spacecraft is closer, it will image Bennu at high resolution. MapCam searches the area around Bennu for satellites and outgassing plumes. It maps the asteroid in 4 different colors, informs our model of asteroid shape, and provides high resolution imaging of the sample-site. OCAMS was developed by the University of Arizona. The OCAMS team is led by Bashar Rizk (Instrument Scientist, UA), Christian d’Aubigny (Deputy Instrument Scientist, UA), and Chuck Fellows (Instrument Manager, UA). 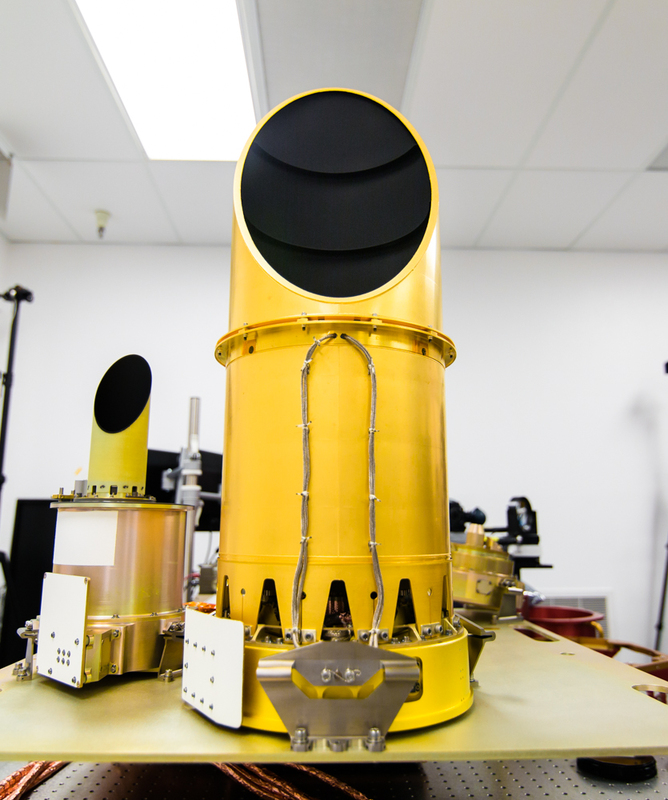 The OSIRIS-REx Laser Altimeter (OLA) is a scanning LIDAR (Light Detection and Ranging). LIDAR is similar to RADAR, but it uses light instead of radio waves to measure distance. 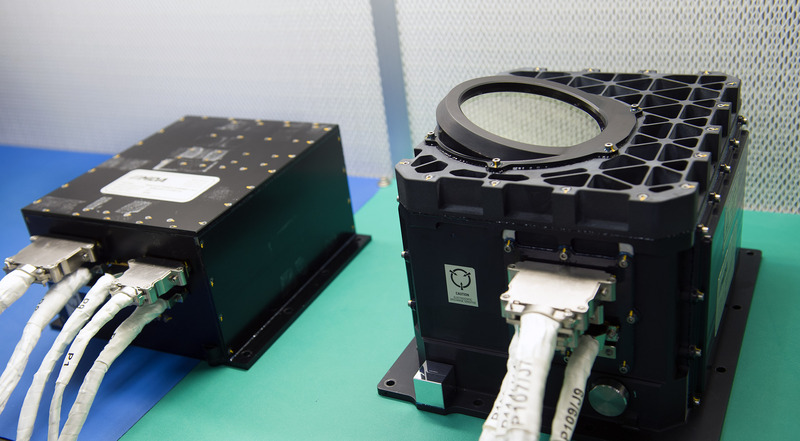 OLA will emit laser pulses at the surface of Bennu, which will reflect back from the surface and return a portion of the laser pulse to the LIDAR detector. By carefully measuring the time difference between the outgoing pulse and the incoming pulse, the distance the spacecraft and the surface of Bennu can be computed using the speed of light. This allows OLA to provide high-resolution topographical information about Bennu during the mission. OLA ranging measurements will also support other instruments and navigation and gravity analyses. OLA is a contributed instrument from the Canadian Space Agency. The OLA science team is an integrated Canada/US team that includes Alan Hildebrand (Canadian PI, University of Calgary), Michael Daly (Canadian Deputy PI and Instrument Scientist, York University), Olivier Barnouin (US Instrument Scientist, Johns Hopkins University/APL), and Beau Bierhaus (US Deputy Instrument Scientist, LM) with support from Canadian instrument developers MDA and Optech. 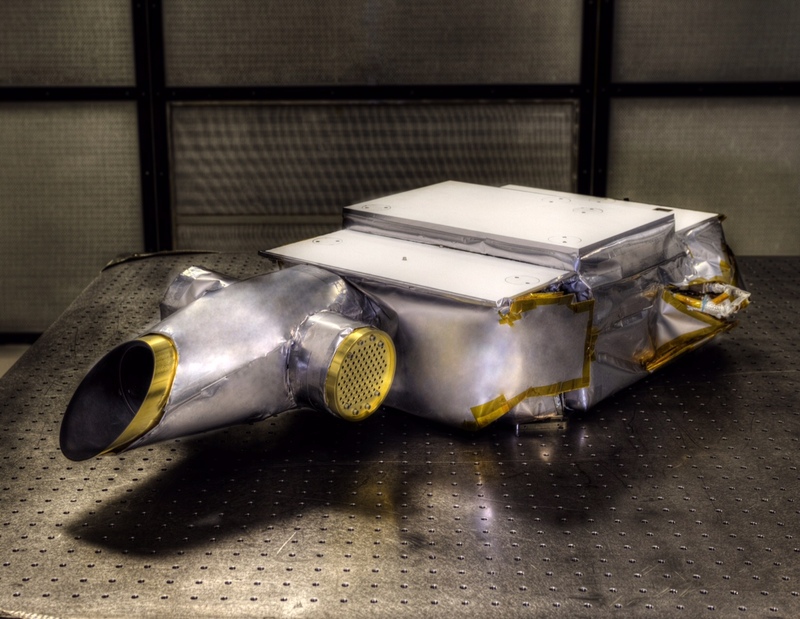 The OSIRIS-REx Thermal Emission Spectrometer (OTES) provides mineral and temperature information by collecting infrared (from 5.71–100 μ m) spectral data from Bennu. In the infrared, most minerals have unique spectral signatures that are like fingerprints. By understanding which minerals correspond to specific spectral signatures, scientists can determine the minerals that are present on the surface of Bennu. Additionally, the emitted heat energy (temperature) at these wavelengths can tell the science team about physical properties of the surface, such as the average particle size. Thermal data from OTES will allow s cientists to determine the mineral composition and temperature distribution of Bennu for global maps and local candidate sample-site areas. OTES was developed by Arizona State University. The OTES team is led by Philip Christensen (Instrument Scientist, ASU), Victoria Hamilton (Deputy Instrument Scientist, SwRI), and Greg Mehall (Instrument Manager, ASU). OVIRS was developed by NASA’s Goddard Space Flight Center. The OVIRS team is led by Dennis Reuter (Instrument Scientist, GSFC), Amy Simon (Deputy Instrument Scientist, GSFC), and Jason Hair (Instrument Manager, GSFC). The student experiment Regolith X-ray Imaging Spectrometer (REXIS) will determine which elements are present, and how abundant they are, on the surface of Bennu. This capability will complement the onboard mineral mapping provided by OVIRS and OTES. REXIS takes advantage of the fact that solar X-rays and the solar wind interact with the regolith on Bennu’s surface. Atoms on Bennu will absorb these X-rays, causing them to become unstable and emit their own x-rays in turn. The re-emitted X-rays have an energy that is characteristic of the atom from which it came. This process is called fluorescence. 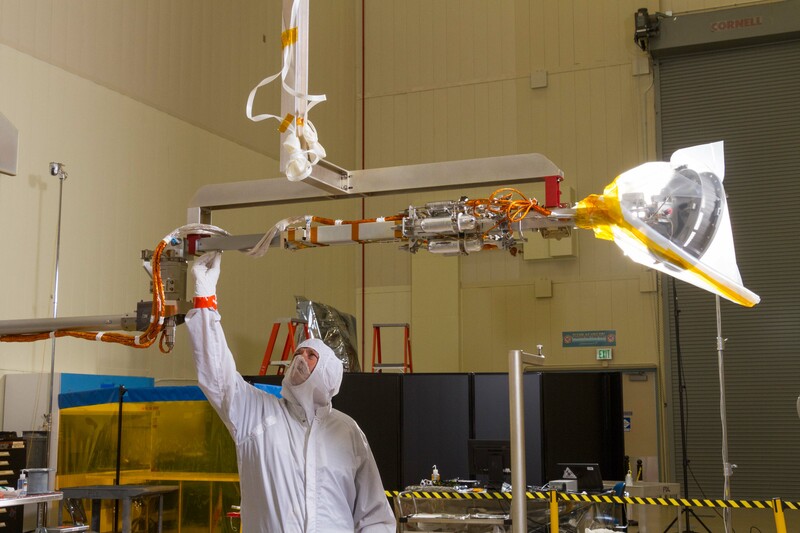 REXIS is a telescope that images the X-ray fluorescence line emission, allowing for mapping of the different elements present on Bennu’s surface. After a competitive selection process REXIS was selected as a Student Collaboration Experiment as part of OSIRIS-REx. REXIS is a collaboration between students and faculty at MIT and Harvard University. At MIT, faculty leadership is provided by Professor David Miller, Professor Richard Binzel, Professor Rebecca Masterson and Professor Sara Seager. At Harvard, faculty leadership is provided by Professor Josh Grindlay. The Touch-And-Go Sample Acquisition Mechanism (TAGSAM) is an elegantly simple sampler head with an articulated arm. Once the sampler head makes contact with the surface of Bennu, a burst of pure nitrogen gas will push surface regolith into the sampler’s chamber. Surface contact pads on the exterior of TAGSAM will also collect fine-grained material as the sample collector touches down on the asteroid. TAGSAM has three separate bottles of gas, which allows up to three sampling attempts. Although TAGSAM is a new technology, vacuum and micro-g tests of the TAGSAM sampler head have proven its ability to collect more than required 60 grams of sample. TAGSAM was developed by Lockheed Martin. The OSIRIS-REx Sample Return Capsule (SRC) is an aeroshell design container with a heat shield and parachutes. 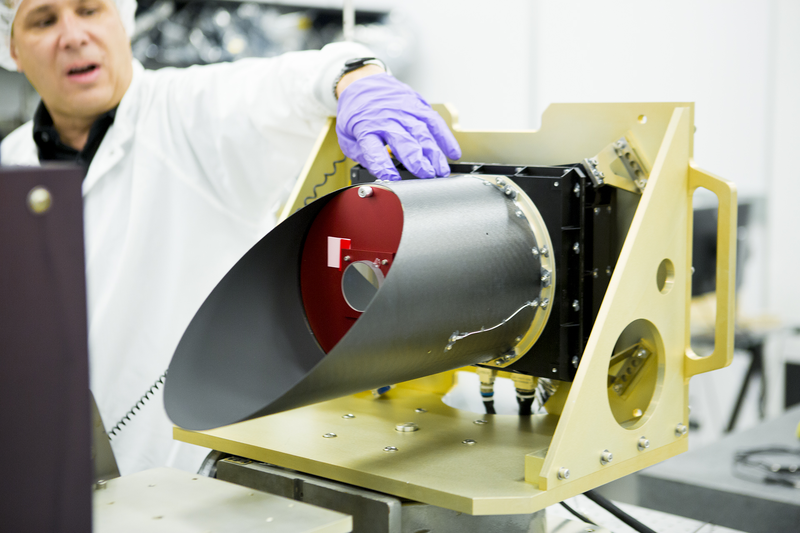 Once the sample of Bennu is collected, the TAGSAM arm places the TAGSAM head into the SRC. At the end of the mission, the SRC containing the TAGSAM head and sample of Bennu will be the only part of the spacecraft to return to Earth. Lockheed Martin developed the SRC from a heritage design; the Stardust mission utilized a similar design to return tail material from Comet Wild 2 to Earth in 2006. The redundant guidance, navigation, and control (GN&C) LIDAR will provide information about the spacecraft range to Bennu’s surface during the TAG Rehersal and TAG Maneuver, to ensure that the spacecraft maintains a safe distance from Bennu. 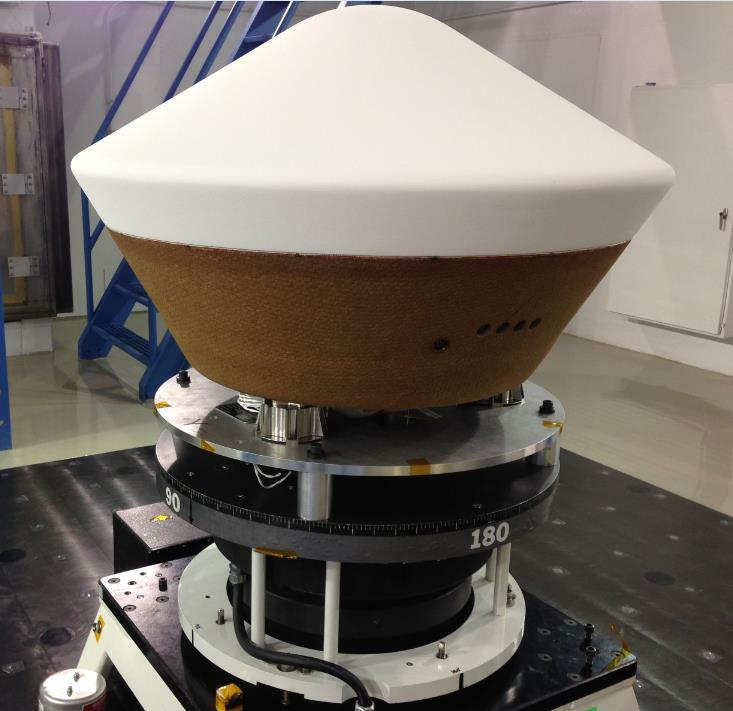 The OSIRIS-REx GN&C Lidar is a 3D Flash LIDAR (Light Detection And Ranging) range camera provided by Advanced Scientific Concepts (ASC). It is capable of capturing a full array of 128×128 independently triggered 3D range pixels with co-registered intensity per frame, and up to 30 frames per second. NavCams are used for optical navigation of the spacecraft. NavCam images will track star-fields and landmarks on Bennu to determine the spacecraft position during mission operations. Each NavCam is a Malin Space Science Systems ECAM-M50 5 Megapixel monochrome camera, and is capable of acquiring still images and high-definition video. StowCam will be used to verify proper storage of the asteroid sample within the spacecraft’s Sample Return Capsule. StowCam is a Malin Space Science Systems ECAM-C50 5 Megapixel color camera, and is capable of acquiring still images and high-definition video.